challenging, because of its lack of iconic features. For what I understand, "lack of iconic features" doesn't exactly mean that there are no interesting subjects, rather that they are not famous; the place it's not an usual destination journey for photographers and you don't have to wake up early in the morning in hope of finding the place not too crowded... Typicall an un-destination is more or less deserted. You can find three examples below. 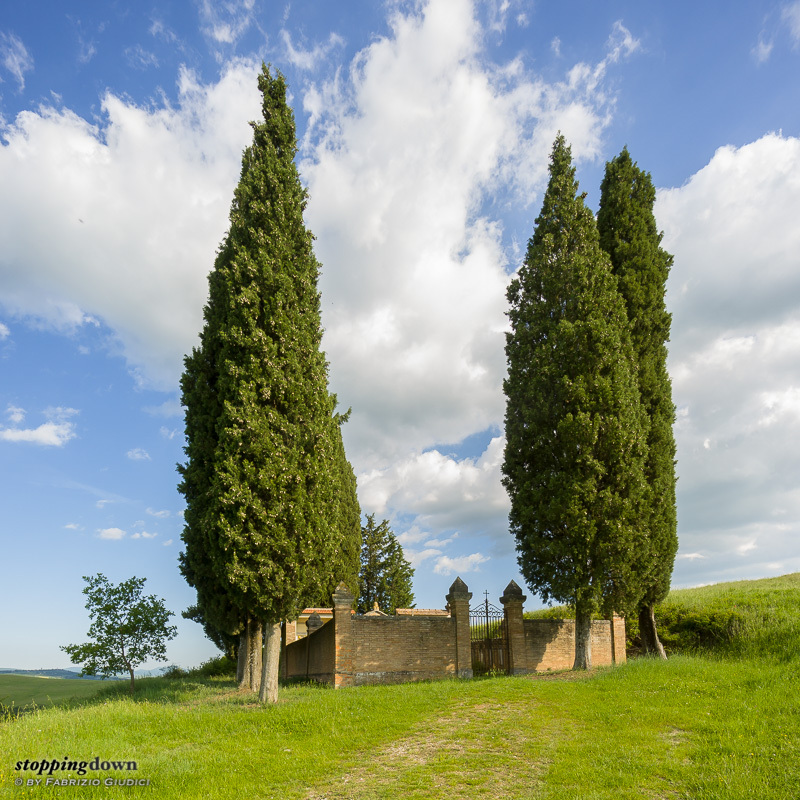 The graveyard is in Val d’Orcia. But it’s along a white road, and most people don’t dare enough. Each time I go in Val d’Orcia I pay a visit to that place… and each time I’m rewarded with some very good shots of many low-profile, “low-profile” things around. Sony α6000 + Sony E 10-18mm F4 OSS @ 10 mm, 1/80 sec @ ƒ/8, +1.70 EV, ISO 100, hand-held. 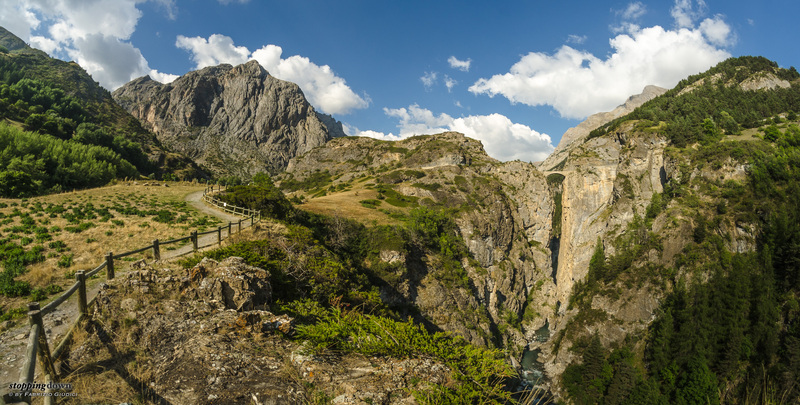 The alpine scene with the funny – and for somebody scary – bridge (yes, it has to be spotted in the photo, as it appears small) is in Alpes-de-Haute-Provence. To see it people should take a short detour from one of the most important alpine passes between Italy and France, but they probably are always too in a hurry to care for it. Paysage près du Pont du Châtelet. Nikon D7000 + Samyang 8mm ƒ/3.5 @ 8 mm, 1/250 sec @ ƒ/11, -1.67 EV, ISO 100, hand-held. 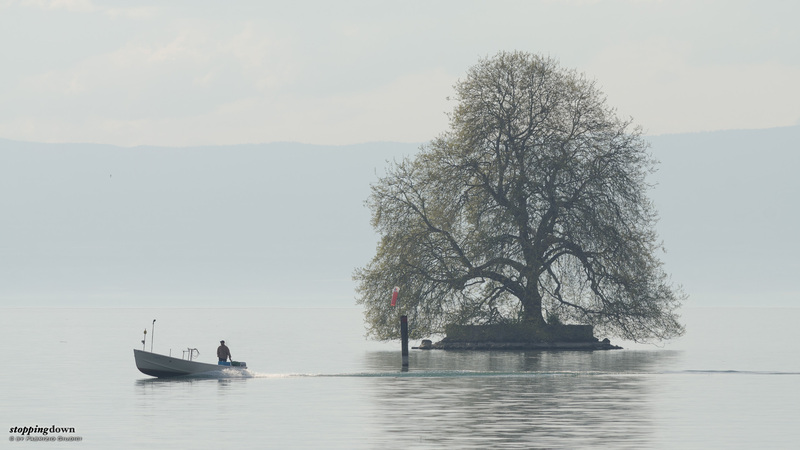 The lonely tree in the middle of the water is near the border of a very famous Swiss-French lake (on the Switzerland side). I think it’s somewhat known, for sure more famous than the two previous subjects. But each time I’m there I don’t see photographers taking care of it. Homme en bateau près de l'île de Peilz. Nikon D7000 + Nikkor 300mm ƒ/4D ED-IF AF-S @ 300 mm, 1/640 sec @ ƒ/8, -1.00 EV, ISO 100, hand-held. I'm so fond to the un-destination concept that I have just created a new theme dedicated to it. As usual, it's all work in progress.